Late Winter is upon us and small smoke plumes are scheduled for many forest areas. The use of fire was one of our earliest and most powerful technologies. And fire (or lack thereof) has played a central role in the makeup of Southwestern forests since the last ice age. The earliest forest inventory records show that our area forests at the turn of the century had on average 20 trees per acre with diameters greater than 6 inches but nearly one-third of trees being larger (18-30 inches in diameter). Old photographs show very open, park-like stands of Ponderosa Pine with extensive grasses beneath. By comparison, more recent inventories show upwards of 140 trees per acre, greater than 90% less than 18 inches in diameter, with little or no grass. Before the 1880’s, forest fires were more frequent, smaller and burned primarily at ground-level. How do we know this? “Dendrochronology” or reading histories from tree-ring data can tell us about climate, moisture levels and fires which leave a scar but don’t kill the tree. Fires occurred every 2-10 years in mid-elevation areas (like Bandelier and the Pajarito Plateau), and somewhat less frequently at moister, higher-elevation areas. These frequent, “cooler” ground fires burned mostly grass, cleared the understories of brush, were well-resisted by thick-barked Ponderosa Pine or Douglas Fir, maintained or created new edge communities for better plant and animal diversity (like where a meadow meets a mature woods), and recycled nutrients to the soil. Why did the frequent fires stop? When the railways came to New Mexico in the 1880’s there was suddenly a way to get western sheep and cattle to markets farther east. Stock grazing had been done since the Spanish arrived in the 1600’s, but not in the wholesale fashion post-railway. Large flocks and herds removed the grasses, leaving room for brush and small trees to invade. Without the tinder of the grasses, fires became less frequent. With more settlement, and the establishment of the forest service, fire suppression also became more prevalent. Both Bambi and a cartoon character named Smokey Bear were used in public service campaigns starting during World War II. (The “real” Smokey Bear didn’t arrive on scene until a fire-orphaned cub was rescued from New Mexico’s Lincoln Forest in 1950.) Americans got the message : ‘only YOU can prevent forest fires’ and fires were bad. By the 1980’s, opinion among forest managers and biologists had begun to swing the other way. The denser, crowded forests of the Southwest had less frequent but bigger, more catastrophic fires. Hot, catastrophic fires wipe out nearly everything, expose mineral soils, and result in erosion which kills even the stream life. In large part because the forests are different, the annual acreage burned in wildfires increased dramatically in the 80’s and 90’s despite our technological advancements. Fire fighting is more costly, more dangerous, and forest recovery is slower. The answers? Slow, painful attempts are being made to return southwestern forests to a more pre-1880’s state. Along NM4 in Bandelier National Monument, a multi-year project has cut trees to leave larger Ponderosas at those historic 20-30 trees/acre densities. Cut trees have been piled and burned and the resulting parkland is growing grass. (To those unaccustomed to the sight it looks artificial or downright odd because it’s been so long since this was commonplace.) 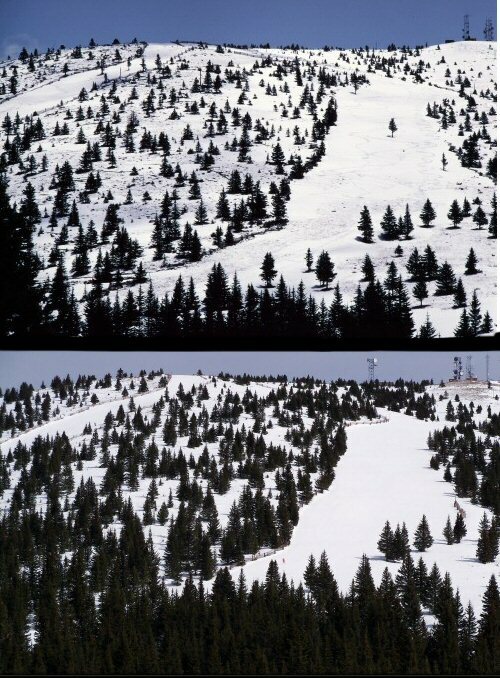 Similar thinning is being done in Santa Fe’s mountain watershed. Work is slow, however, because of the acreage involved, the painstaking manner in which work crews and prescribed fire must be employed, the significant cost, and because public opinion is still heavily influenced by the earlier ‘fire is bad, more trees are good’ campaigns. How can you help? Despite the “ugliness” of stumps and the emotional cries of some folks, support science-based management for the long-term health and preservation of our public lands. Special thanks to Bill Armstrong, USFS-Santa Fe National Forest for conversation and tour on local fire ecology. Johnson, Marlin A. 1996. Changed Southwest Forests: Resource Effects and Management Remedies. In Proceedings of the 1996 Society of American Foresters Convention, Albuquerque, NM. Swetnam, Thomas W., Craig D. Allen and Julio L. Betancourt. Applied historical ecology: Using the past to manage the future. Ecological Applications 9:4 p. 1189. This entry was posted in Current news&events, Human interaction and tagged Forest, mountains, New Mexico, Sangre de Cristo, Santa Fe, Wildfire. Bookmark the permalink. 2 Responses to Where There’s Smoke…. Great and important information on forest fires. This year seems to have prime conditions. Hoping for enough rain to reduce the fire danger.